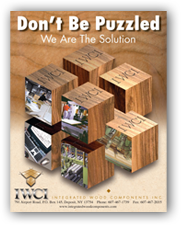 Integrated Wood Components Inc. (IWCI) consistently delivers high quality products and services through attention to detail and use of sophisticated machinery in an integrated manufacturing process. Our Harlan can laminate 23 gram to 100 gram melamine top coated paper (in up to 5’ wide sheets). It can also foil 2.5 mil to 12 mil. vinyl (in up to 5’ wide sheets). Sub straights from 1/10” through to 2” thick can be used. IWCI has a huge selection of different styles and colors of laminates in stock at all times. 1 angular (twin beams) 8’ x 12’ max. sheet size, 6” book height. 1 front loading 5’ x 12’ , 4 1/2” book height. 1 rear loading 5’ x 12’ , 4 1/2” book height. (CAD/CAM loaded) with 2 - 5’ x 8’ tables, 4 router heads, 4 piggy back heads. 32mm point to point milling machine (CAD/CAM loaded) with 2 - 4’ x 5’ tables (can accommodate up to 1 pc. 4’ x 10’), router head, 31 (face) line boring spindles, 10 horizontal boring, 1 saw blade. 1 CNC Biesse 18 - 32 mm point to point milling machine (CAD/CAM loaded) with 2 - 40” x 32” tables, router head, 12 (face) line boring spindles, 4 horizontal boring, 1 saw blade. 2 serpentine/contour single sided Olympic edge band PVC, paper, real veneer and solid wood, 1/4” capacity from 9/32” up to 1 9/16” thick, angle band up to 12 degrees. Membrane and membraneless double shuttle, 4’ x 8’ press with 4” deep 3-D capacity. Ability to shape and rout and 3-D press any colors or sizes up to 4’ x 8’.